2017 will be a big year for the shooting community. Let’s hope not for the wrong reasons. We’ve got at least 3 major political fights on our hands, but they are winnable with your support. 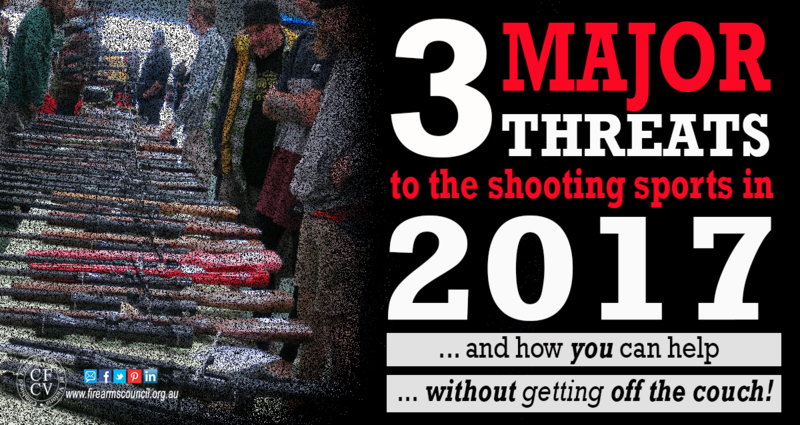 We’ve shown what coordinated political action can do for the shooting sports. the creation of the Firearms Safety Foundation (which helps ensure the shooting community has input into safety training material rather than leave it up to government). We were also able to collaborate with shooting associations to secure some legislative wins, such as expanding membership of hunting clubs as ‘genuine reason’ and stopping dealer fee increases of over 600% which would have driven some of them out of business. This is what we have done, because this type of work is what we do best. Imagine what more we could do with support – and that of your mates. 2017 has some nasty surprises in store for us. With 2017 only just starting, we’ve got at least three fights which will test our ability to ‘hold our ground’. Fight #1 – Keeping our lever-actions: The various state governments will be putting into place new laws to give effect to the recent decision to recategorize our lever-action shotguns from A, to B and D. It leaves other similar firearms, such as lever-action rifles, in a perilous position. If we don’t fight it, we’ll be inviting the government to take something else, like our hunting rifles. 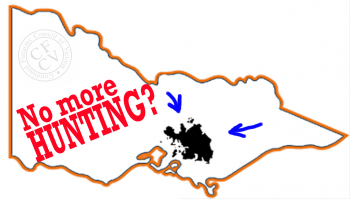 Fight #2 – The right to go hunting: The proposed Great Forest National Park is a plan to lock out your right to go hunting in key parts of Victoria. The map below shows you the areas where hunting could be banned if the Greens get their way among the preference deals leading up to the 2018 Victorian State Election. Even if you’re a target shooter, help us stop this, because the loss of hunting in these areas will weaken the shooting sports considerably. If you want to keep your guns, you need to help us stop this from happening. Fight #3 – More regulations on how you transport and store your firearms: The remaking of the Firearm Regulations, which come into effect in 2018, is being done under a shroud of secrecy, when normally the shooting community is would be closely involved. The risk to shooters is that the Regulations being developed will contain new restrictions relating to the storage and transportation of firearms never before seen in Victoria. This will affect every shooter. If we’re not careful, we could be in for new requirements including replacing our safes with double key locks, installing monitored alarms (at more than $40 a month) and no longer being able to simply transport our firearms in gun slips in the back of our 4WDs. Shooters in South Australia are about to be hit with new regulations which have over one hundred provisions which will impose new safe storage requirements and add significant costs for gun clubs. We need your help to make sure this does not happen here. By chance, we started working on a new business plan and strategy in 2016 which will give us more direction and capacity through 2017 and 2018, in the lead up to our next state election (in November, 2018). Whether this will be effective will depend on your – and your mates’ involvement with us over the next two years. You can either choose to do nothing. Or you can do something right now. Don’t regret missing your opportunity to stop the next gun grab. We’ll be doing our bit by coordinating information flows and political campaigns aimed at securing pro-shooting commitments at state and federal elections. 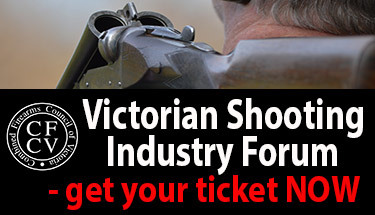 The first thing you’ll see from us is our shooting industry wide forum in a few week’s time. This will enable those who run shooting-related businesses, shooting organisations and individuals such as yourself, to find out more about what is being done ‘behind closed doors’ to protect the shooting sports. You’ll get updates directly from industry leaders, on how we’re tackling our current fights, how we intend to approach the 2018 Victorian State Election. We’ll also cover some of the things we will be looking to achieve over the next couple of years. If you haven’t been to one of our forums before, then why not come along- and find out how you can be part of the solution? We’ll also put on tea, coffee and a good lunch for you! Click here to get your ticket to this unique event. The second thing you’ll see from us is regular video content during the year on issues of importance to what shooters across the state. We’ll be putting out more content online, giving presentations to more shooting clubs and working with other shooting organistions to help them know what they can do to help protect the shooting sports. Like any fight, we need your help to fund what we do. Your donation will help us with our lobbying, cover election costs for pro-shooting candidates, and help get our messages out to the 200,000 plus licenced shooters who, like you, just want to know what they need to do to help. 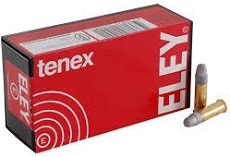 Sponsor us for less than the cost of a pack of 22s a month, and you’ll be helping the Victorian Shooting Industry fight do what you’ve always wanted it to do. For example, we’ve got an urgent need to raise funds to print brochures which will make their way to every gun shop in Victoria! Click here to join our email list for regular updates on what’s happening with your sport, and information on how to make your vote count at the 2018 Victorian State Election. You can opt-out of our email list at anytime, so why not join it now? If you’d like to ask us something, feel free to drop us a line at by clicking here. Im not in Vic but I.want to assist. If we come up trumps there it will help nationally. I want to see all these imbeciles hamstrung in limiting my chosen sport.